Here's the deal. I am only required to collect Sales Tax in my state. So I collect 6.75% as required on ALL purchases. If the individuals want to discuss that with the Department of Revenue - I givbe them the phone number. Before I collect sales taxes for any other state - there needs to be a streamlined sales tax law on the books in which every state collects the same amount for online purchases. Either that - or they can forget me bringing money to their table. Why? There is not a single online eBay merchant except for the big ones who have the resources to keep track of all of the numbers and states that things get shipped to. So I will collect the taxc in North Carolina and the states outside of my state can ask for the money themselves. I am not their keeper, and as I keep being told - you have the responsibility - yes I do. But I do not carry their burdeon. I forgot to add. In New York State, you have 11% sales tax, a 5% Village Sales Tax, a 2% Town sales Tax, a 1% locality tax, and then a 4% City Tax. That comes up to a grand total of 23%. Plus any SIN taxes they add on such as "Coca-Cola" anything is an additional 12%. So when you look at said listings - always remember - to pay the givernment, you must charge the highest rate in eBay as eBay don't have the database to charge accordinglyl. eBay should require every seller to provide a Sales Tax Certificate for every state they are authorize to collect from and the tax rate allowed. Every state I know of makes businesses either post it or make it available to any customer that walks in. There is also another sales tax problem on eBay when sellers use certain third party payment processing apps. If not using the shopping cart, the sales tax is not shown at all, until after you have committed to the purchase. eBay's answer is, then seller is suppose to put the tax information in the description, but even if they do, it is very easy to miss. I live in New York . @ BlueHoundAuctions, I'm not clear that you live in New York, and indeed you cite a horrific tax burden but it is for New York CITY (and Yes, Virginia, there is a ''soda tax'' since the Diet/Healthy Food Police decided to tax ''sugary'' drinks (BTW almost all of which contain high fructose corn syrup, not sugar) as part of their undeclared war on obesity. There are about 60+ different jurisdictions in New York state, the lowest tax is around 7%. The highest as BlueHound says, is in New York City. New York State requires vendors to collect tax based on the BUYER'S location. Per this thread topic, I am suspicious of eBay sellers charging me sales tax on THEIR location, not mine, and some even refuse to accept an exemption certificate from me. I always wonder if these people are collecting money from me and then KEEPING it, never remitting sales tax to NYS. I can only hope they get caught up with at some point .Without complaining to Tax & Finance, there is no way to know if they are investigated, and even then T&F would not tell. RE remitting sales tax, thankfully the state software is now doing the math, but it is a real pain and the pittance they give back as a collection agent nowhere near covers my time. It is further complicated by any number of mid-year changes - such as a city implementing a .25% temporary tax or something that lasts only a couple of months - I even have to keep track of the date a purchase was made, to get it right. So Oneida County rate is X%, but the City of Rome (within the county) is X.25% but only between June 15 and July 31....... and what do I do when the buyer lives OUTSIDE Rome, but has a PO Box there?? I collect taxes from my NY resident buyers absolutely the best I can, and remit the funds to the State; from whence the money is distributed to the individual counties/cities where buyers reside. I can only hope the Feds will enact a reasonable exemption for small sellers, if they ever impose sales taxes on online transactions. Without it, the small businesses that are the backbone of the economy will go out of business. RE Interstate shipment, since I do not have a presence in another state I am free (so far) to sell tax-free to other states. As for buying from international sellers charging sales tax ? DUH ? Never !! "...I am suspicious of eBay sellers charging me sales tax on THEIR location, not mine..." Ebay sellers do not currently have a way to do this. The schedule that we fill out allows for one rate per state. Basically, sales & use taxes are a Caveat Emptor issue... buyers need to carefully look under the Shipping & Payment tab within the eBay item listing. There are 5 states that don't collect S&U taxes, so if a US based seller is collecting from all 50 states, he should be considered suspect; ditto if the % rates are identical and/or exorbitant. Unfortunately, other than closely monitoring the item listing terms, there's scant relief for buyers. This can be reported as an eBay violation (Fee Circumvention) if the seller can't produce a valid sales certificate for the buyer's state. Buyers can also send complaints to the seller's & their own State Attorneys' General offices. Enough complaints regarding specific sellers can provoke action at the state level. Finally, PayPal's resolution center Item Not As Described options offer a check box specifically for Sales Tax Issues. I've personally never had to use this option, but others I've talked to have used it successfully. CAN eBay do anything about this problem? I suspect they can. Minimum, the sales tax info terms should be much more prominent within the item listings, instead of forcing buyers to click here & there to look for the buried fine print. A flat sales tax in the US for all internet transactions, International or Domestic, going to the state the seller lives in would be simple. The venue could collect it and pay it to the states quarterly. The interest on such collections would more than pay for the bookkeeping. Of course, when has it ever been simple when lawmakers get involved. Right away they would want to exempt China who pays nothing, not even adequate postage costs to sell goods in the US. Sounds like a great solution to me. China and other International sellers should not be exempt either. The worst I've seen was a flat 24.7% across the board for all states. The seller was based in Israel. This has caused me to dramatically slow down my ebay buying. I keep getting charged for sales tax by sellers who are not located in my state. What is worse is I believe that many of them are amazon drop shippers who have to pay sales tax to amazon and are "passing on" the cost, and illegally so. I just got a great deal on ebay for some furniture. It was not a dropship (I triple checked first) and it came from their office in another state. I was charged sales tax and I have absolutely no idea why other then obviously they were just ripping me off. On a positive note though it was a great item and am otherwise happy. If your seller had a business presence in your state and/or a business licence in your state, even if they shipped the item to you from another location, they still have to pay sales tax to your state. So don't jump to conclusions. You don't have all the info. While certainly this issue is a problem on Ebay and we all need to be aware of it. It is not the average transaction. Most sellers on Ebay are not scammers. And I might add that most buyers are not scammers either. I'm not sure if I understand what you mean by paying a tax to Amazon. I sell on Amazon, I do not pay any tax to Amazon for anything I sell. Avalara Trust File is sooo easy to use that you're doing yourself a disservice if you ignore it. I knew about it, but didn't use it until a few months ago. Now I feel stupid for not using it earlier. Tech should fix the sales tax issue. The marketplaces and payment processors should integrate sales tax exemption status and federal/state/city automatic filing. Whatever tech company gets in front of this will have some serious success. It's no longer a matter of cost. At this point, sales tax is not going to dissuade potential customers. You either want to have it delivered to your door, or you don't. People will pay sales tax. People have been shopping at local stores and paying it for a long time. Amazon is charging tax in many states now. It's time to finally let the tax collection tech catch up to the marketplace. Many of us here only operate from one state, so there is no need for paying for a program such as Avalara Trust File. Or at least at this time we don't have a need. Things could change if some get their way in changing the Sales Tax structure. For this particular article and the problem it brings forward, the program would do nothing to assist with that. Either a seller is honest or they aren't. There are still some bad sellers out there that give the majority of the sellers a bad name. One would think in the effort of fixing Ebay's reputation they would stop, at the very least, international sellers charging sales tax in states they do not have a business licence. Ebay could do this. They would just need to require some documentation from them. Ebay is capable of doing this. They require certain documents from those that set up accounts as a charity, so why aren't they doing it with international sellers that say they need to charge a US sales tax? Well the thing with ''sales tax'', is that you're supposed to be reporting 100% of your sales anyways (which I suspect 1%-10% of Ebay-based businesses file properly). And then marking exemption for the non-taxable transactions. Those filings are then supposed to match your taxes at the end of the year (and probably your 1099-K's, unless you're taking a lot of offline payments). So Avalara is around $20 a month (plus $20 if you have them e-file for you). They auto-import the transactions (and requires an Ebay spreadsheet), and then auto-fill the forms. It knows which city/state/county the product ships to. And it also records which Amazon Fulfillment warehouse the product ships from. It also knows when refunds occur, and accounts for that. The only thing I haven't done, which I plan to do in 2018, is register in all states where Amazon has fulfillment warehouses - and start recording sales for those states. That gets a bit more expensive, as many states are around $100/yr for a tax license/registration. You can pay Avalara $20 per state to automatically file. Or you can mail the forms yourself for $0. And on the subject of Ebay innovating to keep up with the times... I've given up on them. I treat them as a throw-away marketplace that brings in extra sales (unfortunately, too many sales to ignore them). There are constant unresolved technical problems in just about every corner of their system. They can't seem to fix anything, or get a grasp on the used-product sales process. I genuinely despise that I have to lean on them for added revenue. The best way to look at Ebay, is that you're on your own. They're not going to help you. They're not going to innovate. They're not going to address the concerns discussed on here. They're a big, dumb, sluggish company that owns their space in the market (of second hand and grey market products). If a disruptor is willing to address Ebay's fundamental problems, they could turn Ebay into the MySpace of ecommerce within a year. I predicted it would happen over the past couple years. But, alas, Ebay persists. Reporting all your income to IRS does not mean sales tax was due on all those sales. While some states are currently trying to get sales tax imposed on every sale of a product that comes into their state, it hasn't happened yet. Where do you get your numbers. You stated that ONLY 1-10% of Ebay sellers actually report their income correctly, I highly doubt that. Maybe 10% or less do NOT report correctly, but the vast majority of Ebay sellers are good honest people. I do not subscribe to the conjecture that most sellers are dishonest which is exactly what you are suggesting. I'm unsure as to what this statement means "...marking exemption for the non-taxable transactions." More info please. @Marie... I'm not sure if I understand what you mean by paying a tax to Amazon. I sell on Amazon, I do not pay any tax to Amazon for anything I sell. As an Amazon *seller*, you wouldn't be required to pay sales tax, but your buyers are. Currently, Amazon's policy is a straight 8% levy for items sold to any of the 45 states (& DC) that actively collect sales & use taxes. eBay sellers who drop-ship from Amazon are considered Amazon buyers (not sellers) & they're assessed sales tax. These folks try to pass on that expense by incorporating eBay's tax schedule feature into their listings. Keeping in mind that eBay doesn't charge a Final Value Fee on sales tax, this is an ideal solution for sellers to recover this expense. I understand better now, thank you. I do not ever use Amazon as a drop shipper, so I was not aware. If the seller collects sales tax, they are responsible for submitting that to the proper state, just as we do on Ebay. If the seller is remitting it to Amazon for them to remit to the proper state, then of course that is OK.
Again, YES there are some dishonest sellers on Ebay as there are on other sites too. They do NOT represent the majority of sellers. The same holds true for buyers. Ebay and other sites could and should do a much better job filtering these types of members off the sites. @Marie - When you pay sales tax, you're supposed to be reporting your full sales, and then claim exemption on out-of-state sales. For instance, if you do $50k in sale, you record (on the sales tax forms) that you sold $50k, but then mark an additional line with out of state purchase exemptions (which might be $49k). Then you pay tax on the non-exempt sales. If you're filling out the forms properly, you're not supposed to only report in-state sales. This is for AZ. I'm not sure how other city/state forms work. But I assume it's all the same. By following that rule, my 1099-K's sync up with the sales tax forms. I occasionally get a wire transfer or mail-in payment (maybe once a year). But that's very rare. My sales go through PayPal, Stripe, and Amazon. With that number, I find is over 98% of my sales are outside of AZ. Amazon's system further complicates it, as a product shipping from a CA warehouse to an AZ address is still exempt. On the other note - there are "companies" and "personal sellers" on Ebay. There are a lot of Ebayers who run a little operation out of their house, and avoid taxes or any other filings. They view it as a hobby. Lots of little "Ebay Store" sellers operate like this. I haven't researched this. It's just what I see from being around the second-hand business for fifteen years. I'm in it to win it and run a "real business". Sometimes I look back and envy those who do it as hobbiest on-the-side income. Haha. You are confusing different elements of state taxes. Because I am a retailer on the internet, there is a line on our state taxes where I report my gross sales, you deduct from the gross sales what was sold inside the state. 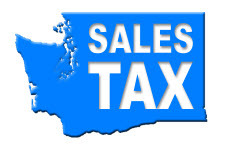 There is a separate line to report my in state sales, which are the ones subject to state sales tax. So it appears that the state I am in does it the exact opposite from the state you are in. But the net results are the same. I operate out of my home and I run a "real business" just as many of us sellers do. I report all my income both to my state and to IRS and always have. There are rules for claiming things are a hobby income. For those risking that when it isn't true, that's on them. Because of internet sellers not claiming their sales as income when they should have been is exactly why the 1099K was born. IRS has always had issues with internet sellers not reporting income correctly. Now with the 1099K it remedies much of the problem. But still the smaller sellers should be reporting income correctly too. It does not excuse them just because they don't qualify for a 1099K. There will always be those that try to cheat on taxes.